“We only have what we notice,” affirmed a Zen Buddhist student. My mixed media paintings and drawings spring from what I notice during my everyday meanderings and from what I read and hear. Several pathways through landscape support my artwork. I appreciate walking and observing the elements of the natural world such as the passage of light and clouds, where water meets the terrain’s edge, or the angles and curves of tree branches. Living on the West Coast introduced me to Japanese art, particularly bold sumi-e marks. For example, the journey of walking through the painted landscapes of wall scrolls and folded sectional screens has led me to create a series of small canvases of the shifting light and fog, where each canvas contains part of the entire panorama. Another series of 500-pound watercolor paper panels stitched together with tree branches present brightly colored trees alternating with abstract brush marks. Conversely, reports on the degraded environment such as mountaintop removal, land scarred by hydraulic fracturing and, or tsunami debris traversing the Pacific Ocean impact my work. The aesthetics of watercolor and ink contrast with real life destruction. One series evokes the aftermath of blasting through mountains resulting in the heavy-metal deposits in tailing ponds. Another sequence depicts telephone poles collaged onto watercolor paper panels with a copper mining pit in the background. 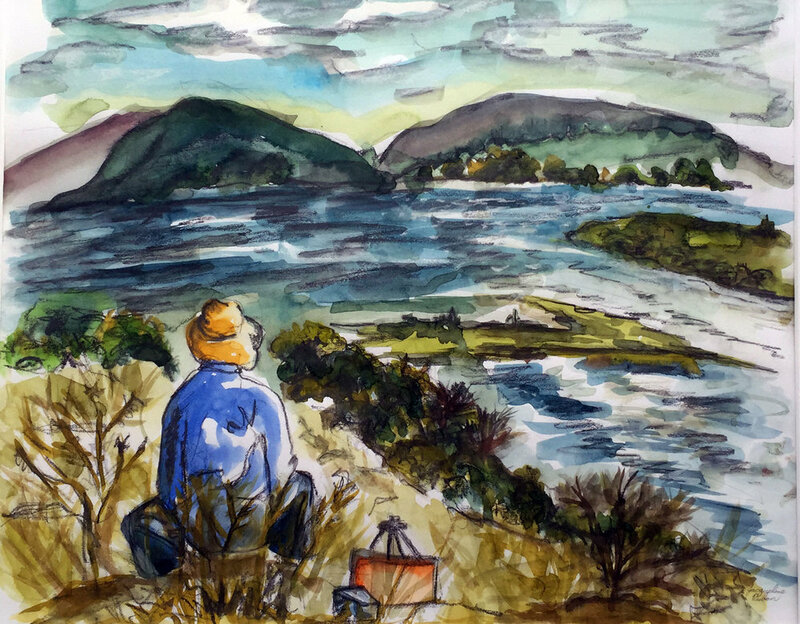 Even though I enjoy painting and drawing other themes such as still life and portraits, I keep returning to the landscape as a quiet source for personal encouragement along with a source of engagement with the larger world.